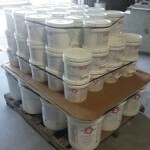 PRIMER/BONDER/FOAM REPAIR: Prime All/SK200 Elastomeric Primer/Sealer is a 100% styrene acrylic coating. It combines an extremely long lasting, high performance polymer resin with the highest grade sealing and bonding additives to assist in a tight seal of the porosity of various materials in urethane foam, built up roofing (BUR), rolled shingles, tar & asphalt straps over metal, wood or masonry decking. It serves to help block the emissions of various gases, including the migration of petroleum solvents and sulfur particles that could cause delamination and/or discoloration of the protective top coat. It has excellent adhesion to most all substrates and greatly aids in ponding water resistance. (recommended for drains and scuppers) VOC under 250 grams per liter. Prime All/SK200 has been found to be VERY EFFECTIVE in the repair and recoating of burnt and exposed foam. Prime All/SK200 forms a water tight skin over foam while also penetrating, sealing exposed foam cells and allowing for superior adhesion of top coats.